STAMP OF APPROVAL COMING SOON!!! There are very limited supplies of this first box, so be sure to get on the wait list. Based on the response we’ve had so far, I’m afraid this is going to sell out fast. This is NOT a kit! This is an exclusive collection that was designed for this specifically and will not be available in stores until 2016…. I have some exciting news! Kelly Latevola invited me to take part in her series CASEing Genius. You can find the link here. 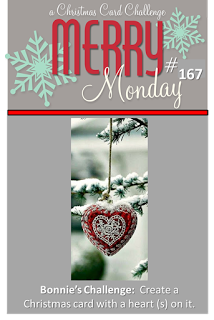 She showcases a fellow crafter on her blog every Monday. 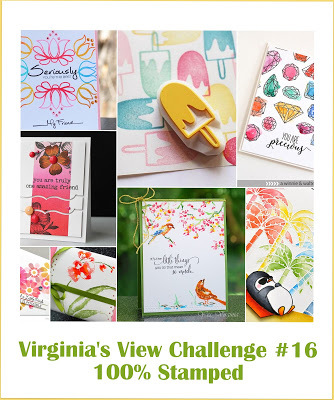 It's the perfect series in which to learn and be inspired by other crafters within this fun cardmaking community. Kelly, herself, is super sweet and talented and has coloring skills to die for. I would love if you hoped over to her blog and checked it out. Thank you so much Kelly for thinking of me! Before you go I want to keep you up to date on our StampNation California Vacation stops. Day 5 we traveled to the San Diego Zoo. For Day 6 we are visiting the heart of San Francisco and the famous Postcard Row, across from Alamo Square comprising of 7 houses called, The Painted Ladies. They are known for their Victorian and Edwardian architecture as well as the use of 3 or more colors of paint to enhance their design features. You can now see Painted Ladies throughout San Francisco, but these 7 are the original and most photographed because of their prime location across from the park. Tomorrow is our last day of our vacation but the fun thing is you can travel along with us weeks, months and years from now and be inspired by the different challenges. Where will we end our fantastic California Vacation and who is our SURPRISE sponsor along with Ellen Hutson? Come check out StampNation for some clues and to play along!!! Day 4 of our StampNation California vacation takes us to Alcatraz. From the glitz and glam of Hollywood to the most infamous prison in California. Today we are headed to Alcatraz, also known as "The Rock". Alcatraz Prison is located on a small island in the San Francisco Bay. At one time it housed such famous criminals as Al Capone and "Machine Gun" Kelly. Today you can visit this National Historic Landmark by ferry and talk a walking tour of this historic site. Put on your prison stripes and hop on the ferry with us to Alcatraz. We will be highlighting the amazing Essentials by Ellen line from Ellen Hutson so you will find some fun and innovative ways to put these products to use! And what’s a vacation without a shopping spree???? There is also a discount to the Ellen Hutson store, for Sistahs only. We also have a SURPRISE SPONSOR!!!! Catherine will be dropping hints and clues all week long. Watch for them on StampNation. 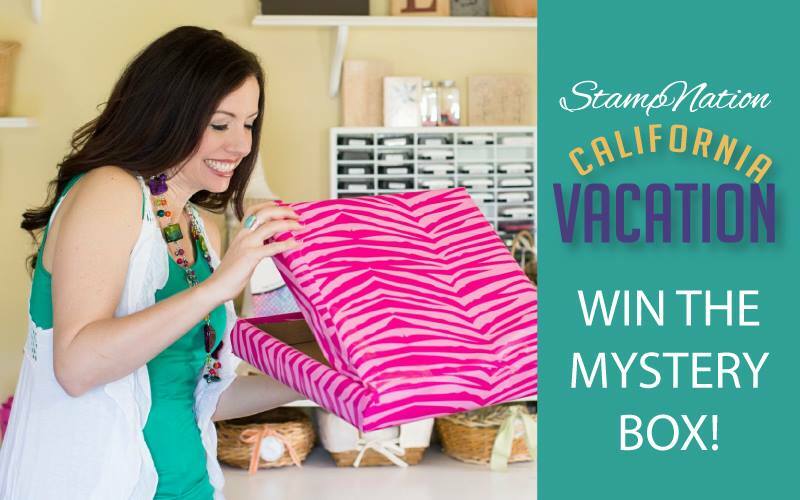 We would love to have you join us on our virtual vacation! 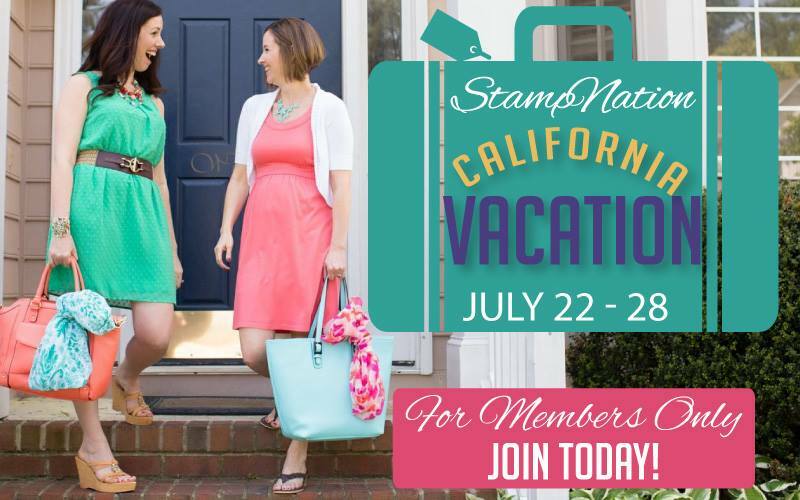 Click here to learn more & join StampNation now! Day 3 of our StampNation California Vacation takes us to Hollywood! Lights, Camera, Action! It's time to roll out the red carpet and soak in the glamorous side of California. When people visit CA they hope to see a few movie stars. If you can't find your favorite movie star on the red carpet, perhaps you can find their name on the Hollywood Walk of Fame. 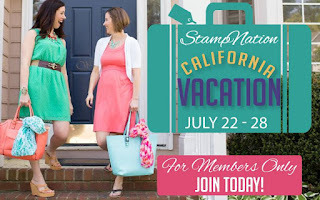 Today on our StampNation California Vacation we are headed to the Beach. Let's head to the beach, and soak up some sun. It's going to be a fun day of playing in the ocean, napping on the sandy shore and playing at one of the gorgeous CA beaches. Here is a peek of the DT's cards. 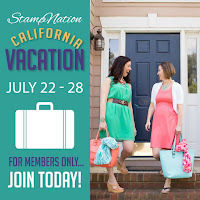 It's time finally time for our StampNation virtual vacation!!! This year we are headed to California, the Golden State. From the gold rush of the 1800's, to the sunny summer skies that seem to last all year long, to the glitz & glam of Hollywood, this state is truly is golden. We could spend a month here and still not see it all. Let's see what we can pack into a week visiting California. The first challenge is to add gold to your card, in honor of the Golden State. 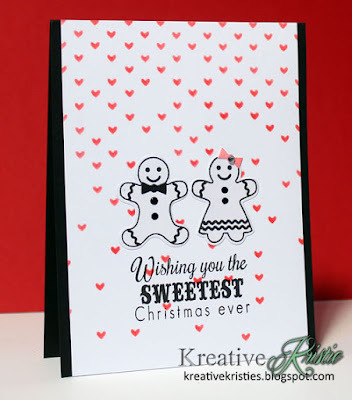 This week Bonnie challenges us to create a Christmas card with a heart on it. I created a CAS card using the Folk Heart dies from the Essentials by Ellen line and the image and dies from the Nativity set by Simon Says Stamp. I watercolored the image with my Kuretake Gansai Tambi watercolors. The star is cut from Dazzling Diamonds Glitter paper by SU! How are you? I am GREAT! I am getting back from a few days away with crafty friends. On Monday I drove to PA to see my good friend Maureen. We created and had a great time on Monday. I had a sleepover at her house. On Tuesday I drove an hour and a half to meet up with 4 more crafty friends for lunch and some shopping at Hobby Lobby. We didn't have time to create anything together but it was fun just catching up. I had another sleepover and then drove home on Wed. Such a fun little getaway! in the online card class, "In the Mood!" 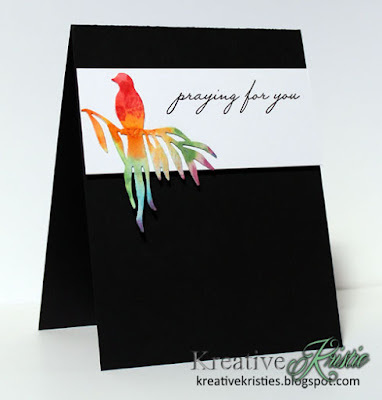 I used a Heidi Swapp stencil on my background, sponged a rainbow of distress inks through it. Trimmed down the piece using Stitched rectangle dies by Lil' Inker Designs. I then stamped the sentiment from Winnie & Walter. The bird is from Top Dog dies. Matted it onto a piece of black and though you can't see it in the photo, I added Wink of Stella to the bird for some shine. My next cards use the same bird die from Top Dog Dies. 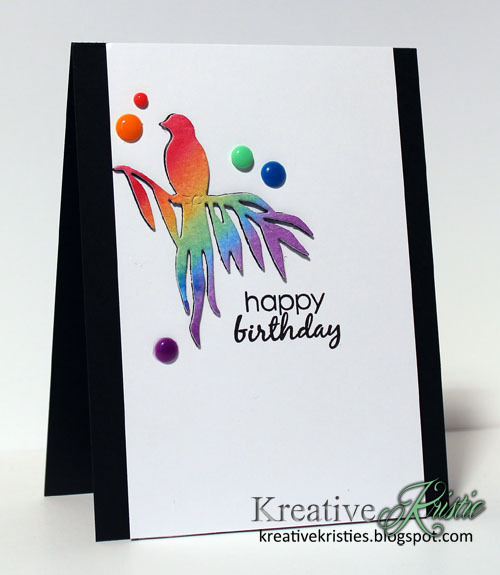 I am adding these over at Seize the Birthday: Anything goes! Can you tell I was inspired by this amazing Mood Board?!!!!! I am not too sure about the third card but I am posting it anyway. 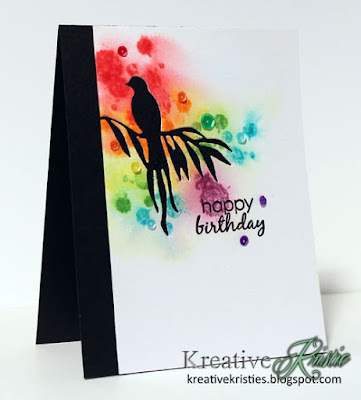 I stamped using distress inks and then spritzed with water to move the color around but it didn't move as much as I wanted. I didn't want to throw it out so I just went with it. The last card uses the bird from the second card. 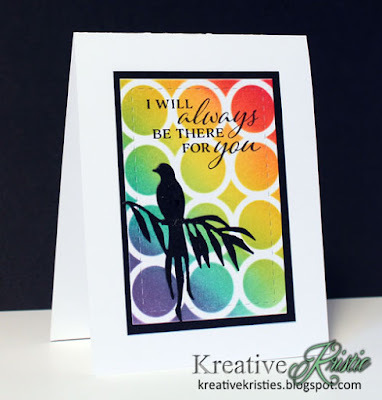 I am playing along with the girls over at Whimsy Stamps Inspirations challenge. Their challenge this month is Christmas in July and they asked me if I wanted to play along with them. Of course, I said yes! I love making Christmas cards especially, using Clearly Whimsy Stamps and dies. I sponged some distress ink through the falling hearts stencil by Simon Says Stamp. Stamped and die cut these adorable gingerbread people from the Gingerbread People stamp set and matching dies. The sentiment is from the same set. Added a bow tie to the boy and a little hair bow for the girl. I glued them onto the card in order to keep it flat. 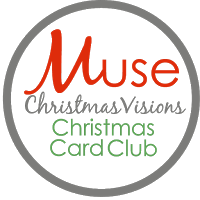 Sharing my card inspired by Chriss Blagrave's card over at Muse: Christmas Visions. I was inspired by the colors on Chriss's card. 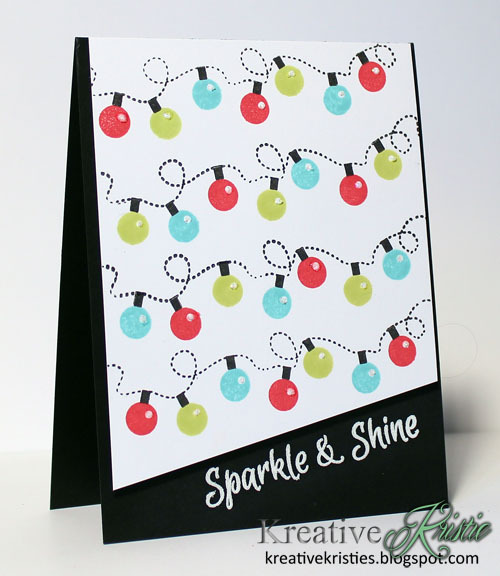 I stamped the string of lights from Clearly Whimsy's stamp set Sparkle & Shine. Added the bulbs in the colors from Chriss's card. Trimmed off the bottom to leave room for the white embossed sentiment. You can't really see the little bits of sparkle on each bulb but I did add a dot of dazzling details on each one. 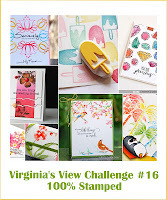 I am also adding this over at Virginia's View Challenge: 100% Stamped.